The Northrop Grumman E-8 Joint Surveillance Target Attack Radar System (Joint STARS) is a United States Air Force airborne ground surveillance, battle management and command and control aircraft. It tracks ground vehicles and some aircraft, collects imagery, and relays tactical pictures to ground and air theater commanders. The aircraft is operated by both active duty Air Force and Air National Guard units and also carries specially trained U.S. Army personnel as additional flight crew. Joint STARS evolved from separate United States Army and Air Force programs to develop technology to detect, locate and attack enemy armor at ranges beyond the forward area of troops. In 1982, the programs were merged and the U.S. Air Force became the lead agent. The concept and sensor technology for the E-8 was developed and tested on the Tacit Blue experimental aircraft. The prime contract was awarded to Grumman Aerospace Corporation in September 1985 for two E-8A development systems. In late 2005, Northrop Grumman was awarded a contract for upgrading engines and other systems. Pratt & Whitney, in a joint venture with Seven Q Seven (SQS), will produce and deliver JT8D-219 engines for the E-8s. Their greater efficiency will allow the Joint STARS to spend more time on station, take off from a wider range of runways, climb faster, fly higher all with a much reduced cost per flying hour. In December 2008, an E-8C test aircraft took its first flight with the new engines. In 2009, the company began engine replacement and additional upgrade efforts. However, the re-engining funding was temporarily halted in 2009 as the Air Force began to consider other options for performing the JSTARS mission. The Air Force began an analysis of alternatives (AOA) in March 2010 for its next generation ground moving target indication (GMTI) radar aircraft fleet. The study was completed in March 2012 and recommended buying a new business jet-based ISR aircraft, such as an Air Force version of the Navy P-8 Poseidon, and the RQ-4B Global Hawk Block 40. However, at a Senate Armed Services Committee meeting on 20 March 2012, the Air Force said it cannot afford a new ISR platform. The E-8 is considered viable in the near and medium terms. As of October 2012, a test plane has had a Hewlett-Packard central computer installed, with work to begin on the rest in 2013. Before the AOA started, Northrop Grumman received funds for two batches of new engines. One set of engines has flown on a JSTARS test plane, and the other set is in storage. The Air Force does not plan to replace the engines of the 16-plane fleet due to the fiscal environment. The company wants to replace the aircraft's data link, but the Air Force will not, due to cost and because they can still receive data through satellite links. Northrop also wants to upgrade its communications with Force XXI Battle Command Brigade and Below because of the Army's shift towards the system. The Air Force says JSTARS is in a phase of capability improvements and is expected to remain in operation through 2030. On 23 January 2014, the USAF revealed a plan for the acquisition of a new business jet-class replacement for the E-8C JSTARS. The program is called JSTARS Recap and plans for the aircraft to reach initial operating capability (IOC) by 2022. The airframe must be more efficient, and separate contracts will be awarded for developing the aircraft, airborne sensor, battle management command and control (BMC2) system, and communications subsystem. JSTARS Recap is currently unfunded and the Air Force FY 2014 budget did not include requests. The program may be launched in FY 2015. On 8 April 2014, the Air Force held an industry day for companies interested in competing for JSTARS Recap; attendees included Boeing, Bombardier Aerospace, and Gulfstream Aerospace. Air Force procurement documents call for a replacement for the Boeing 707-based E-8C as a "business jet class" airframe that is "significantly smaller and more efficient." Current pre-decisional requirements are for an aircraft with a 10-13 person crew with a 3.96–6.1 m (13.0–20.0 ft) radar array. Though smaller than the crew and radar size of the E-8C, it could be challenging to meet those demands in a typical business jet and could require a relatively large platform. The staffing and sensor requirements are comparable to the cancelled Northrop Grumman E-10 MC2A, which was originally planned as the E-8's replacement. The Air Force plans to award a contract at the end of FY 2016, a relatively quick pace partly to avoid budget redistributions to other programs. Replacing the E-8C avoids nearly $11 billion in operations and sustainment costs needed to keep the fleet relevant and airworthy. The aircraft is to fly at 38,000 ft for eight hours. Program managers are interested in integrating an FAA-certified flight deck, aerial refueling capability, and potentially full motion video and the joint range extension applications protocol to transmit data to joint agencies at further distances. Another potential feature could be beyond-line-of-sight communications with unmanned aerial vehicles like the RQ-4 Global Hawk. Gulfstream confirmed in late May 2014 that they would offer their Gulfstream G650 for the Air Force's JSTARS replacement. Their bidding strategy is to team with a defense contractor to serve as the integrator. Bombardier is considering offering the Global 6000, in use with the Royal Air Force as the Raytheon Sentinel and the USAF as the E-11A airborne communications relay. Aircraft selection may be based on whether the service wants a large airframe to carry heavy payloads, or a smaller aircraft that would be more nimble and operate from shorter runways. Companies that attended the industry week in April that are contenders for providing electrical systems include Harris Corporation, Rockwell Collins, Lockheed Martin, L-3 Communications, Raytheon, DRS Technologies, and BAE Systems. Boeing plans to offer a solution based on their Boeing 737-700 commercial jetliner airframe; the 737-800 configuration is already in military service with the U.S. Navy as the P-8 Poseidon for maritime surveillance, and would be favored if the Air Force chooses a larger platform. The decision on airframe size may be based on whether the Air Force thinks it can have processing capabilities off-board or if it wants to keep everything on the physical platform. Northrop Grumman has also announced their intention to compete for the future of Joint STARS, although they have not confirmed what airframe they will use. The company has a Gulfstream G550 test aircraft that has been integrated with Joint STARS capabilities and has flown for more than 500 hours. The test aircraft's existence was announced in 2014. Lockheed Martin has teamed with Raytheon and L-3 Communications to offer a JSTARS replacement, but will not decide which platform to use until the Air Force decides if it wants a converted airliner or business jet-sized class aircraft. On 7 August 2015, the Air Force issued contracts to Boeing, Lockheed Martin, and Northrop Grumman for a one-year pre-engineering and manufacturing development effort to mature and test competing designs ahead of a downselect in late 2017. While the E-8C will begin retirement in 2019, an EMD contract will be awarded for two test aircraft, followed by low-rate production of three aircraft for initial operational capability in late 2023, with the remaining 12 aircraft purchased through 2024. On 2 March 2017, Northrop Grumman announced the submittal of its proposal to the U.S. Air Force for the Joint STARS Recapitalization program. During the fiscal 2019 budget rollout briefing it was announced that the Air Force will not move forward with an E-8C replacement aircraft. Funding for the JSTARS recapitalization program will instead be diverted to pay for development of an advanced battle management system. Northrop Grumman E-8A Joint Surveillance Target Attack Radar System. The radome for the side-looking radar is visible under the forward fuselage. The E-8C is an aircraft modified from the Boeing 707-300 series commercial airliner. The E-8 carries specialized radar, communications, operations and control subsystems. The most prominent external feature is the 40 ft (12 m) canoe-shaped radome under the forward fuselage that houses the 24 ft (7.3 m) APY-7 passive electronically scanned array Side looking airborne radar antenna. To pick up moving targets, the Doppler radar looks at the Doppler frequency shift of the returned signal. It can look from a long range, which the military refers to as a high standoff capability. The antenna can be tilted to either side of the aircraft for a 120-degree field of view covering nearly 50,000 km² (19,305 mile²) and can simultaneously track 600 targets at more than 250 km (152 miles). The GMTI modes cannot pick up objects that are too small, insufficiently dense, or stationary. Data processing allows the APY-7 to differentiate between armored vehicles (tracked tanks) and trucks, allowing targeting personnel to better select the appropriate ordnance for various targets. On 1 October 2002, the 93d Air Control Wing (93 ACW) was "blended" with the 116th Bomb Wing in a ceremony at Robins Air Force Base, Georgia. The 116 BW was an Air National Guard wing equipped with the B-1B Lancer bomber at Robins AFB. As a result of a USAF reorganization of the B-1B force, all B-1Bs were assigned to active duty wings, resulting in the 116 BW lacking a current mission. Extensive efforts by the Georgia's governor and congressional delegation led to the resulting "blending", with the newly created wing designated as the 116th Air Control Wing (116 ACW). The 93 ACW was inactivated the same day. The 116 ACW constituted the first fully blended wing of active duty and Air National Guard airmen. On 3 September 2009, Loren B. Thompson of the Lexington Institute raised the question of why most of the JSTARS fleet was sitting idle instead of being used to track insurgents in Afghanistan. Thompson states that the JSTARS' radar has an inherent capacity to find what the Army calls 'dismounted' targets—insurgents walking around or placing roadside bombs. Thompson's neutrality has been questioned by some since Lexington Institute has been heavily funded by defense contractors, including Northrop Grumman. Recent trials of JSTARS in Afghanistan are destined to develop tactics, techniques and procedures in tracking dismounted, moving groups of Taliban. On 28 November 2010, amidst escalating danger of war breaking out between North and South Korea, the South Korean government requested the U.S. to implement JSTARS in order to monitor and track North Korean military movements near the DMZ. Single aircraft, was to be a U.S. Navy E-6 but transferred to the U.S. Air Force as a development aircraft before it was decided to convert second-hand Boeing 707s (1 from a Boeing CC-137) for the JSTARS role. Production Joint Stars platform configuration converted from second-hand Boeing 707s (1 from a CC-137). This article incorporates public domain material from the United States Air Force document "Factsheets : E-8C Joint Stars". Retrieved on 29 August 2014. August 2013. ^ "Northrop Grumman E-8 Joint STARS---Usnook---The first portal of US info". www.usnook.com. Retrieved 2018-11-26. ^ Boeing 767-400ER E-10A Archived 2011-10-21 at the Wayback Machine. Spyflight, June 2008. 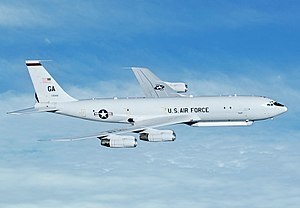 ^ USAF can't afford JSTARS replacement Archived 2013-01-17 at the Wayback Machine - Flightglobal.com, 20 March 2012. ^ With No Replacement in Sight, Joint STARS Feel Strain - Defensenews.com, 9 October 2012. ^ Butler, Amy (15 September 2014). "U.S. Air Force Scrimps On Jstars Recap Program". Aviation Week. Archived from the original on 16 October 2014. Retrieved 16 October 2014. ^ "Boeing, Lockheed, Northrop make JSTARS cut" Archived 2015-08-10 at the Wayback Machine. Flightglobal.com, 9 August 2015. ^ "Executive Summary Aircraft Accident Investigation: E-8C 93-0597, Al-Udeid Air Base 13 march 2009" (PDF). Archived (PDF) from the original on 27 January 2013. Retrieved 20 May 2017. ^ "Lexington Institute". lexingtoninstitute.org. 3 September 2009. Archived from the original on 7 August 2017. Retrieved 9 May 2018. ^ "Lexington Institute". Lexington Institute. Archived from the original on 5 October 2017. Retrieved 9 May 2018. ^ DefenceNews, Issue November 23, 2009. ^ Gilligan, Andrew (28 November 2010). "North and South Korea move close to war footing". The Daily Telegraph. Archived from the original on 5 February 2018. Wikimedia Commons has media related to Northrop Grumman E-8 Joint STARS.